saturday night was the missions bbq dinner at our church. missionaries from all over the world and right in our own city were there to share with us how God is working in their lives. mission work has really been heavy on my heart for the last few years. there have been so many opportunities to sign up for missions trips to either go to the other side of the world or to new york city. i want so badly to go on a missions trip across the globe. or to new york city. i want so badly to go to an orphanage and hold babies who don't get held on a daily basis. 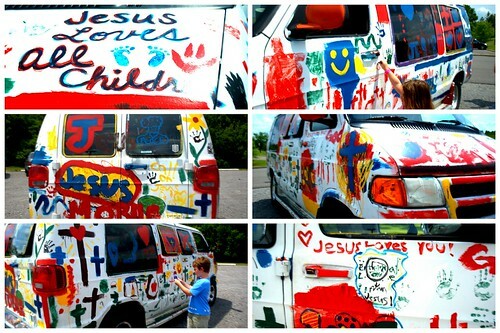 i want to go tell children about Jesus. i want them to know that He loves them SO MUCH. but, it's not my season to go across the globe. or even to new york city. right now God has me here with my own babies. i have to hold them. and tell them about Jesus. make sure they know He loves them SO MUCH. i can help right here in my own city. manna cafe from clarksville, tn was at the missions bbq dinner. they are a ministry that feeds the homeless. i've told hubs a couple of times over the last few years that we should go help at a soup kitchen. i think he thought i was kidding. or maybe he didn't feel led quite like i do. but, something changed in him saturday night. he told me to get some info from the folks who run manna cafe and we'll look into volunteering. he even said we'd get a baby sitter and go spend the evening feeding the homeless. but, i'm seriously looking forward to it! How awesome! I have always felt led to missions, and I lived overseas for a summer in college teaching English. But since I have gotten married, had babies, and all that, those opportunities fell by the wayside - or so I thought. I have been noticing all of the local places where I (and my family) can help. We routinely help with a local food bank. It's not Asia or Africa, but it is helping people who need help! Way to find a way to impact those around you and share love, mercy, and grace of Jesus!